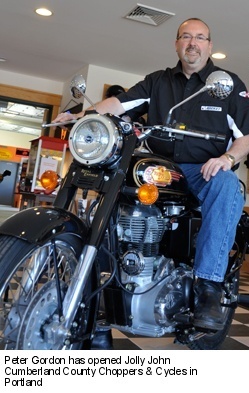 Royal Enfield, generally considered the oldest continuously produced motorcycle brand in the world, is sold by Maine's newest motorcycle dealer, Jolly John's Cumberland County Choppers. Cumberland County Choppers opened in April of this year. Business was so good, according to co-owner Peter Gordon, that the dealership moved less than two months later to its current location at 342 Warren Ave., Portland. "We had only two service bays at the first location," Gordon explained. "The new shop has eight bays." Gordon, a 51-year-old South Portland resident, spent 27 years in the car business before turning his attention to motorcycles. He was the general manager at Jolly John's auto dealership and married "Jolly" John Pulsifer's daughter, Michelle, 17 years ago. "Michelle grew up in the car business," Gordon says, "but Michelle and I had pretty much had it with cars by the time the dealership was sold. We both love motorcycles and thought the Portland market was underserved. We started thinking about opening a motorcycle dealership." Gordon says he and Michelle, who is president of Cumberland County Choppers, wanted to offer "motorcycle sales and service for everyone at affordable prices and give people another choice as far as brands and service." Having owned a 2005 Harley Davidson Softail Deluxe, they initially focused exclusively on selling used Harleys and servicing any motorized vehicle with two wheels. But when Service Manager Darrell Clark suggested the Gordon's look into Royal Enfield, they quickly pursued and acquired a franchise. Cumberland County Choppers has since expanded to also sell Ural motorcycles and several brands of scooters. "Business has been very good," said Gordon, who credits Michelle with coming up with the name of the dealership, which pays tribute to her father (the dealership website is jollyjohn.com and the phone number is 800-HI-JOLLY). The Gordons' sons, 16-year-old Michael and 13-year-old Chris also help out around the dealership, making it a true family business. Thanks to bikes such as the high-mileage and highly appealing and eye-catching Royal Enfield models, it should be a business with a bright future.